Welcome to the Events with RSVP tool. 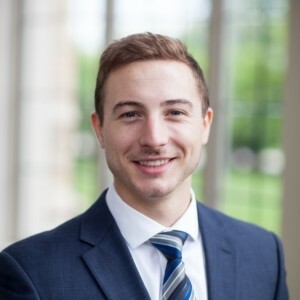 To use this tool, simply log on to AddEvent.com, create an event on the Events with RSVP page, and share it using one of the methods outlined later in this article. This tool is a great place to start if you have an individual event you want your users to be able to add to their calendars. It’s also the perfect solution if you need your users to RSVP for your event – simply click a box to enable RSVP functionality, then choose what information you want to collect from your users when they RSVP. The Events with RSVP tool makes it easy for your users to add your events to their calendars through social media like facebook or twitter, or in emails and campaign tools like MailChimp, Marketo, or Salesforce. How many people learn about an event, make a mental note to add it to their calendar later, but then never do? Not anymore. More events on your users’ calendars = increased top-of-mind brand awareness = increased attendance rates = good things for your business. Once you’ve created an event on the Events with RSVP page (this process is simple and extremely intuitive) and decided if you want your users to have to RSVP or not (RSVP isn’t required), it’s time to share your event. There are several easy ways to do this. The first way is through a simple URL that is automatically generated. You can share this link on social media like Facebook or Twitter, or in an email. When clicked, the link will take your users to an event landing page that is also automatically generated, and hosted by AddEvent. The landing page will contain a short description of your event and an add to calendar button. Your users need simply select their desired calendar, and your event will be added. Just like that. The landing page is fully customizable (requires coding knowledge), but the image below is one example of what it could look like (default design). With a single click, your users will be able to navigate to this landing page from a link in a newsletter, a post on Facebook, or anywhere else you decide to share it. After clicking ‘register’, they will be asked to indicate if they are going, and to enter their name and email address as shown below. RSVP forms are fully customizable, meaning you can change both the design of the page (requires coding knowledge) and also the type and amount of information you wish to collect from your users. All information entered into RSVP forms is collected, organized, and displayed for you in your AddEvent.com account. RSVP forms also have a set of automated messages and reminders built in. When a user RSVPs for your event, they will automatically be sent a confirmation email. Then as your event gets closer, your users will automatically be sent email reminders to help increase the participation rate for your event. You can choose if and when these emails are sent, and as usual, the content and design of the emails is fully customizable. Here’s a play-by-play of your users’ experience. Click. Your event landing page is open. Click. RSVP sent, and your event added to their calendar. Quick. Simple. Seamless. Your users will probably spend more time wondering how it could possibly be so easy to RSVP for an event than they will actually RSVPing. The second way is the links method as described in the Subscription Calendar Doc. You can use this to share your event in emails, newsletters or campaign services such as MailChimp, Marketo or Salesforce. Simply choose if you’d prefer to show your users text or icons, click “copy”, and then paste directly into the content editor you’re working with. 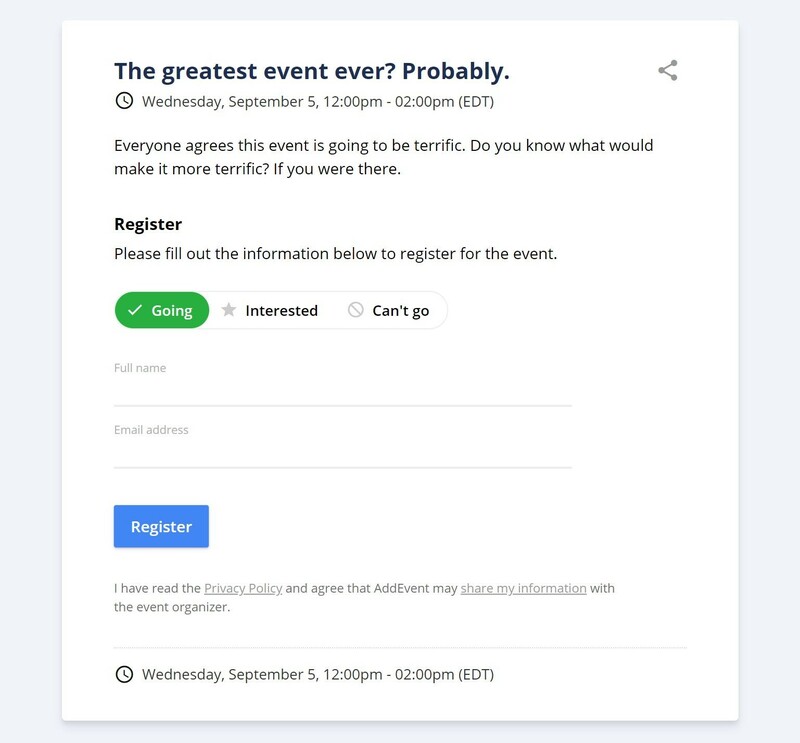 If you have enabled RSVP functionality, your users will be taken to a landing page like the one shown above from which they will be able to RSVP for your event and add it to their calendar. If you have not enabled RSVP functionality, your event will be added to your users’ calendars directly when they click the link in your email, instead of being taken through a landing page. The third and final way to share your event is through a series of URLs that bypass the landing page, redirect to your user’s chosen calendar service, and add the event. There is a separate link for each of the 5 major calendar services. I email the link out to everyone, and by the end of the day I know who is and isn’t coming, and the meeting is on everyone’s calendar. It makes things easier for everyone. That’s one personal example. We have also had customers who have used our Events with RSVP tool for online conferences with 20,000 attendees, so it has a wide range of applications. Regardless of the application, we make it easy for you to make it easy for your users. And we’ve consistently proven that making it easy for your users results in more events on their calendars, which leads to increased top-of-mind brand awareness and attendance rates, which… well, you know the rest. We love it, and we know you will too. If you haven’t already, sign up to discover the impact this tool alone can have on your business.